April 2013 Hello all! This cold weather has been relentless, hasn’t it? I finally saw a robin yesterday so hopefully that means there’ll be a turn in the weather and we will be able to get outside. My garden beckons, but I need a bit more warmth to venture out there. Soon I hope. Our bus trip to Canada Blooms was a big success even though we didn’t quite fill the bus. Everyone who went had a great time. There were 17 door prizes given out consisting of gift certificates from Fred’s Workwear, Sub Venture, and Super Video. There was a 50-50 draw which raised $130.00 giving the winner $65 and the DHS $65. We also sold 15 new memberships so all in all it was a very successful day. I’m sorry to say that I missed it because I was on vacation but I’ll be going next time. Canada Blooms and the National Home Show are always amazing and a great way to get yourself into the mood to get outside and get growing. The Dunnville Home & Garden show is rapidly approaching. It is going to be held at the Dunnville Memorial Arena and Community Lifespan Centre on Friday April 19th and Saturday April 20th. We will have a booth there so be sure to come and visit. 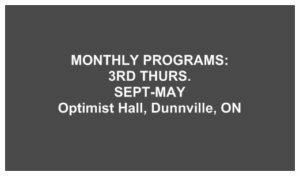 There will be gifts and raffles and a great chance to see what Dunnville and area has to offer in the way of home improvement, gardens and crafts. Our guest speaker for this month will be Lester Fretz. He was a big hit with the members last year and we’re looking forward to seeing what he has for us this year. His scheduled topics are blossom rot and other problems with tomatoes and peppers, and rooting techniques of hardwood cuttings. Last but not least, don’t forget the Annual Plant Sale in May. When the weather warms up and you venture out to your garden remember the DHS when you start to divide your plants. Pot a few and set them aside to donate to the sale. The plant sale is our biggest fundraiser of the year and last year was the most successful plant sale in the DHS’s history. With everyone’s generous donations and hard work I’m sure we can be just as successful this year. On a sad note, Past President Peter Prosser (1989,1990) passed away on February 25th. I never had the opportunity to meet Mr. Prosser but I’m told that he was highly respected and very much liked by the executive and members. Garden tip of the month: Examine shrubs for winter damage and prune all dead and weakened wood. Winter mulches can be removed from your roses. Plants started indoors can be hardened off outdoors in a cold frame and keep your hoe sharp—don’t allow weeds to get an early start in your garden. Meeting was opened by Lori Maracle at 7:04 p.m. There were 57 people signed in. Minutes from March 2013: Pauline Bradford made the motion to have them accepted as read and Judy Jeffery seconded the motion. Motion was passed. There was no treasurer’s report presented tonight. It will be presented at next month’s general meeting. Lori spoke about the bus trip to Canada Blooms which was a success. Everyone had a good time and 19 members were signed up that day. The Home Show on April 19th and 20th was also a success. Our booth looked awesome! We signed up 15 members and raised $705.00 which will be split with the students of the Dunnville Secondary School for making the arbour and Adirondack chairs which were first and second prize. Thank you to all the volunteers who manned the booth set it up and took it down. It’s a lot of work to put this together and it can’t be done without everyone’s help. The DSS students are trying to raise money to buy a computerized lathe so they will be joining us at our annual plant sale on May 11th, showing what they build and taking orders. The plant sale starts at 8:00 a.m. Judy passed around a volunteer signup sheet. Volunteers are needed Friday evening (May 10) from 6:00 to 8:00 p.m. to collect and sort donations. Please meet at the condo parking lot next to the bridge. Trailers will be needed to move the plants overnight since we can’t leave them at the Optimist Hall so if anyone has one please bring it with you. Set up is 6:00 a.m. Saturday morning. The sale usually lasts until noon. Plant donations are needed and if you need pots you can go to Judy’s place to pick some up. Please be sure to label your donations and make sure they are potted, not in bags or boxes. Debbie Thomas announced that if anyone is interested in selling crafts at the plant sale they need to contact Judy Jeffery asap because space is limited. There will be a fee for setting up a craft table so please contact Judy about the details and you must bring your own table. The Optimist club will be holding an indoor garage sale the same time as our plant sale. Hopefully this will draw more buyers to our sale. The District 9 AGM Spring Forum is this coming Saturday (April 27th). Please plan on attending. There is an entry fee of $10 per person. This includes 2 speakers (Linda Crago and Jack Kent) and lunch and refreshments will be provided. There is a flower show and photography contest so if you are interested you can go to our website to see the complete list of classes and rules. Please help with providing some baked goods such as cookies. This meeting is very important and we want to make a lasting impression on the other society members who will be attending. Lori spoke about the public flowerbeds. There has been a lot of activity already this year with new planting and last year’s bulbs blooming. There are new pines planted on each side of the bridge, and numerous perennials in the new beds downtown. Annuals will still need to be planted. Our planting day will be May 25th. As usual, volunteers will be needed and each of you will be treated to lunch at McDonald’s afterwards. Hours worked by high school students will count toward their mandatory volunteer hours that are needed to graduate. They can help out with various projects as well as planting. The courtyard at the high school needs a makeover. If anyone is good at this sort of thing and would like to lead the DSS students please let Debbie Thomas know. The Mudcat parade is June 8th. This year’s theme is “Go Wild”. Members are invited to help with decorating the float and joining us in the parade. Each year we have lots of fun. Our annual members’ only garden walk will be held at Rosa Flora. It’s a great opportunity to get a “behind the scenes” look at the greenhouses and there will be a BBQ at the home of Rob and Lori Maracle afterwards. There will be a $5.00 fee per person to attend. Don’t forget about our upcoming Trillium awards and our photography contest. There will be 4 categories again: Winter, Spring, Summer and Fall. Photos must be 4” x 6” in size. Lori introduced our speaker for the evening, Mr. Lester Fretz. He spoke about innovative and inexpensive ways to recycle items to make seed trays and mini greenhouses. He spoke about starting new plants from seeds and cuttings and graciously donated many items to the Ways & Means draw. As expected he was a very interesting and entertaining guest. Hopefully he will be able to visit again next season. The Ways & Means draw raised $83.00. Thank you to the members who donated items and thanks to Betty Ballanger and Debbie Wilson for looking after the ticket sales. Thanks to Maura Cooper, Jenny Elgersma, Pauline Bradford and Barb White for bringing the goodies and looking after the kitchen. Next month’s meeting is Thursday, May 16th and it will be our annual rose draw. Don’t miss it!